Artist in residence Richard Plummer (right) observes Savanna Spence as she works on a piece of art. 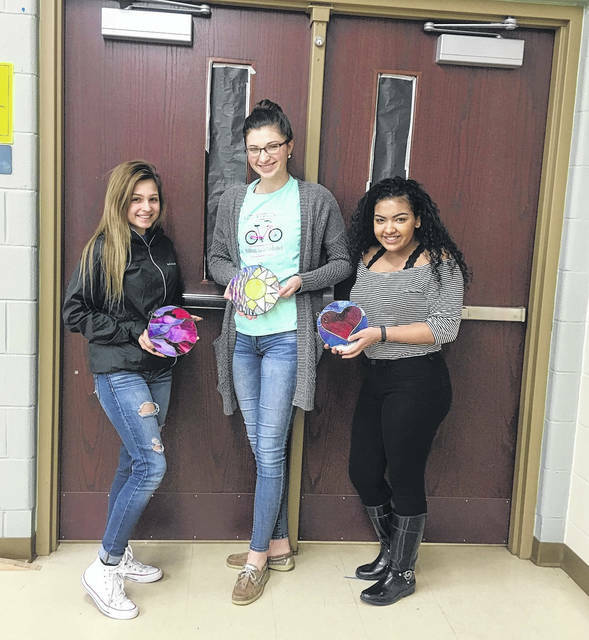 Showing off their stained glass projects are (from left) Haven Adkins, Savanna Spence and Taliyah Taylor. 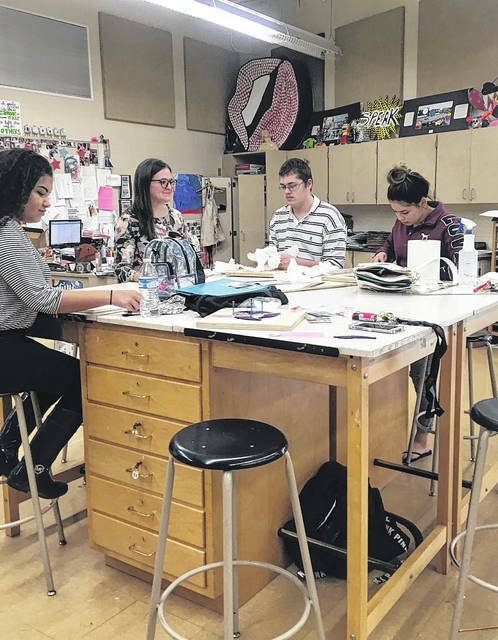 Portsmouth High School art teacher April Deacon (center) looks over her students’ artwork. Beautiful colors shining from colorful stained glass windows are a vision to take in at any time. They are often the focal point for the magnificent church windows that have some wonderful pieces of stained glass in them. 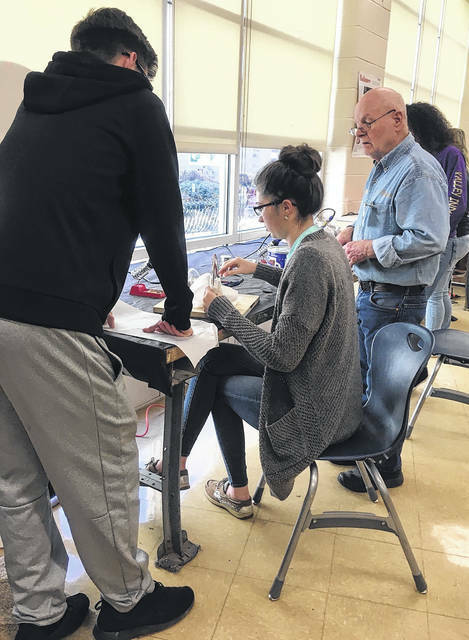 Art students at Portsmouth High School, along with their teacher, April Deacon, have had an artist in residence this nine weeks to help them learn how to make stained glass. Richard Plummer is a stained glass artist hired by PHS to teach this skill. He says he has been coming into the classroom twice a week for two months. Plummer says he has been doing stained glass art for 35 to 40 years. He owns his own business in Rosemount called Stained Elegance, which he says has been there for 30 years. “I like it. It’s enjoyable. They are pretty cooperative,” Plummer says of working with the students. Deacon says Ralph Applegate, who is director of buildings and grounds at the schools, is a friend of Plummer’s, and Plummer had also done a small stained glass piece for their River Days float, “so when I saw that, I thought, wouldn’t it be wonderful to have him make a piece for their human rights garden project. It’s a plant garden, but also a sculpture garden. ”He has been doing these small pieces with the students — and they each get to take their work home — and he’s gonna work with them to design two large-scale stained glass sculptures for the pollinator gardens.” Deacon also says the students really enjoy having him, and this was apparent. As the students walked into the classroom, they were immediately drawn to Plummer. In December, the students took a field trip, where they visited Franklin Art Glass in German Village to learn about stained glass processes and techniques. Plummer admits that stained glass is a dying art that he loves, and that it takes a long time to do it. He says the art students even got a little discouraged the first month, but not now, when the things are coming together. Darla Zeller, was working on a piece that had a flower and some leaves, and beside her, Kylisha Kearns was also working on a different flower piece. Both said it was a bit of hard work, but they really liked doing it. Haven Adkins and Savanna Spence chimed in and said it was very time consuming, but they loved it. Spence was working on some melting part of a project a little later, and she said that part was the very best. The pollinator garden is Deacon’s project, and for the past couple of years, her students have been working on a large scale public art space and garden located on campus. In September 2016, Portsmouth City School District began work on the Human Rights Garden Project. The sculpture garden is an arts integrated interdisciplinary learning environment created by and for the students. The project has thus far involved hands-on activities for about 400 students in fifth through 12th grades, and includes instruction in eight different academic disciplines. To date, Portsmouth students have worked with five visiting artists and two visiting educators, and have enjoyed five field trips to enrich learning associated with the project. The PHS art class has two more visiting artists beginning March 15. One is a Brooklyn artist named Traci Molloy, and the other is Susan Camp from the University of Maine. With Camp, the students will do some casting that will eventually end up in the garden, also. This garden, along with many of the students’ artwork, will surely be something worth seeing when all is completed. As for this part, these high school art students are contributing something they will remember for a lifetime.